Actvity Summary: This exercise set explores marine sedimens using core photos and authentic datasets in an inquiry-based approach. This exercise set explores marine sediments using core photos and authentic datasets in an inquiry-based approach (Figure 2.1). 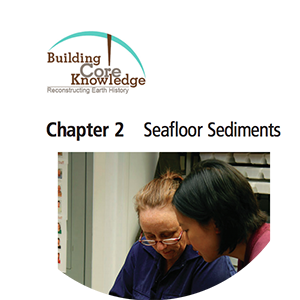 Your prior knowledge of seafloor sediments is explored in Part 2.1. In Part 2.2 you will observe and describe the physical characteristics of sediment cores. In Part 2.3 you will use composition and texture data from smear slide samples taken from the cores to determine the lithologic names of the marine sediments. In Part 2.4 you will make a map showing the distribution of the primary sediment lithologies of the Pacific and North Atlantic Oceans and develop hypotheses to explain the distribution of the lithologies shown on your map.